Probably the most divisive band to recently emerge from London's fertile soil, HMLTD are a 6-piece whose mangled reinterpretation of pop music has done nothing if not turn heads over the past year. A collective whose ferocious work ethic, volatile genre fusion and desire to turn their shows into a complete, fully realised artistic experience has captured imaginations cross country, whilst also egging on the criticisms of ‘style over substance’ and ‘pretension’ that come thick and fast for any artists attempting to try and break out of the shackles of being "just another guitar band". A hectic summer of festivals has seen the group's live performances garner much acclaim. However the band's own personal boast is the way in which they transform the venues they play into their own contorted realm, a space where everything bears as little similarity to the outside world as possible. With a much larger following in the country’s capital than elsewhere, their headline show at the Electric Ballroom in Camden was set to present their non-stop electric dance show on their biggest platform yet. On entering the venue, punters are handed a small pouch of seaside rock presented to look like ecstasy, and a handful of trading cards that give the illusion of being HMLTD’s own twisted tarot cards that predict only the fantastical. The usual generic lighting of the venue is completely replaced throughout by a sordid red, whilst tens of thousands of greek muse masks adorn every wall completely, ready to be snatched and worn. No one could accuse HMLTD of not trying hard enough, and despite its upfront artifice, perhaps even tackiness, getting sucked into this seedy underworld is seemingly impossible. Challenging people’s perceptions of a rock show, the clock strikes half past nine to usher 20 naked men and women on stage, covered in body paint. They stand completely static, backs to the wall, before the band spring to the stage in their theatrical getup, which lies somewhere between medieval, 70s glam, and leather homoerotica. Proxy Love opens the set with synth clashes that shimmer with the same urbane beauty of those on The Human League’s Dare but seemingly echo noughties Calvin Harris in the process, whilst the silhouettes of this eccentric six piece make themselves known to the audience for the first time. The ringleader of this skewed cabaret show is Henry Spychalski, the messianic figurehead that leads HMLTD. His pronounced movements cast a sordid puppet show on the ceiling of the Electric Ballroom. Writhing and pouncing, his onstage demeanor owes more than a little to Iggy Pop, to Ziggy Stardust, and to Lux Interior, but as his near naked figure towers over the audience it matters not that his onstage persona is a knowing pastiche of all these characters. During the higgledy piggledy Where’s Joanna?, his demeanor echoes that of a pantomime clown, a mime going through agony and ecstasy all at once, and during Satan, Luella and I, he sets the scene for his extraterrestrial pop noir erotica with lyrics that verge between a seedy serenade and something all the more tacky. The band’s sound is so singular throughout, each song sounding wholly unlike the last. New number Death Drive is a skewed US stadium rock track, punctuated by a bold, heavily reverbed synth that makes it feel more like it’s come from the backwaters of the galaxy than the dregs of American whiskey bars, whilst the lightning guitar lick of spaghetti western trap number To The Door illuminates the venue. The band close with their debut single Stained, as strobes illuminate their triumphant exit and a stage hand stands at the edge of the stage throwing red glowsticks at the audience. 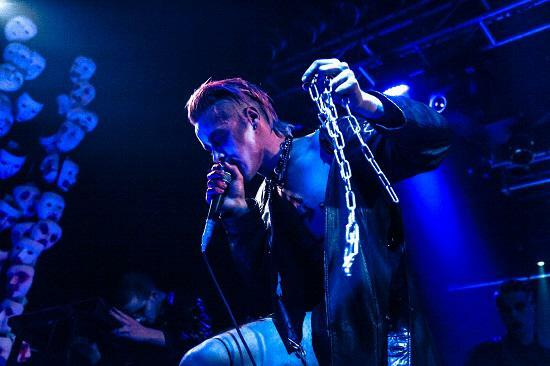 A HMLTD gig, a mere three singles in, feels ritualistic, dark, and otherworldly, and despite their penchant for experimenting with the mere bones that make up pop, it feels still like they’re playing a venue much too small for their ambitions.